Want a faith that breaks the status quo? Five years since it was first released, ‘Crazy Love’ has sold over two million copies. Francis Chan even admits he didn’t see that coming! Now with an extra chapter, this updated version still holds the same powerful message it did five years ago. The 11th chapter offers Francis’ reflections on the past five years that have passed since he wrote the book, plus some examples of people who are now living in a passionate love relationship with God. “As you read this new edition of ‘Crazy Love’, my prayer for you is the same as it was when I first wrote it... I want you to see that the crazy people in this world are those who experience God’s love and remain complacent, not those who let go of all they have and follow Him completely.” – taken from the updated preface, Francis Chan. Francis Chan is the best-selling author of Crazy Love and Forgotten God and the host of theBASIC.series. He has also written the children's books Halfway Herbert, The Big Red Tractor and the Little Village and Ronnie Wilson's Gift. Francis is the founding pastor of Cornerstone Church in Simi Valley, California, and is the founder of Eternity Bible College. He also sits on the board of directors of Children's Hunger Fund and World Impact. Francis lives in California with his wife, Lisa, and their four children. Crazy Love - Updated Edition by Francis Chan was published by David C Cook in January 2013 and is our 1387th best seller. The ISBN for Crazy Love - Updated Edition is 9781434705945. Be the first to review Crazy Love - Updated Edition! Got a question? No problem! 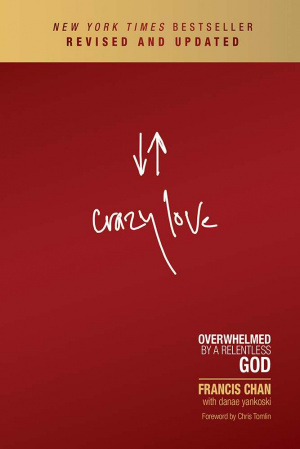 Just click here to ask us about Crazy Love - Updated Edition. Have you ever wondered if we're missing it? It's crazy, if you think about it. The God of the universe the Creator of nitrogen and pine needles, galaxies and E-minor - loves us with a radical, unconditional, self-sacrificing love. And what is our typical response? We go to church, sing songs, and try not to cuss. Whether you've verbalised it yet or not.we all know something's wrong. Does something deep inside your heart long to break free from the status quo? Are you hungry for an authentic faith that addresses the problems of our world with tangible, even radical, solutions? God is calling you to a passionate love relationship with Himself. Because the answer to religious complacency isn't working harder at a list of do's and don'ts-it's falling in love with God. And once you encounter His love, as Francis describes it, you will never be the same. Because when you're wildly in love with someone, it changes everything.